“I know exactly what I want” was what Isabel told me when we first met. She knew where she wanted to be and what features she wanted in her home. We met on a Saturday, toured five homes, and she knew that the first one was meant to be hers! 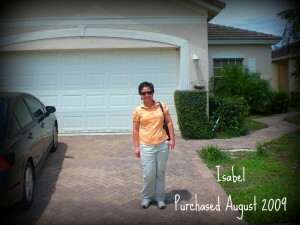 Isabel was another one of my buyers who bought something that she could move right into. She scored a three bedroom, two bath home in Lake Forest (St Lucie West) that backs up to some open space with no neighbors in her back yard. The property was a short sale but an attorney was working the file and already had the seller’s bank’s approval so we were able to close within 30 days. The seller was going to take two of the custom fans and the washer and dryer but we negotiated for her to leave those items as well as have the bank provide $2500 to Isabel’s closing costs. Apparently you have to buy a new bed when you buy a new house – or at least that’s what Isabel tells me! – so she is planning on making that one of her first purchases. Other things on her agenda are to remove the unruly shrubs outside the front of the house and to have some touch-up paint done to the interior. Isabel was a joy to work with and I am looking forward to seeing her decorating abilities as she makes her new house a home. Best wishes to Isabel and her new home in Lake Forest!